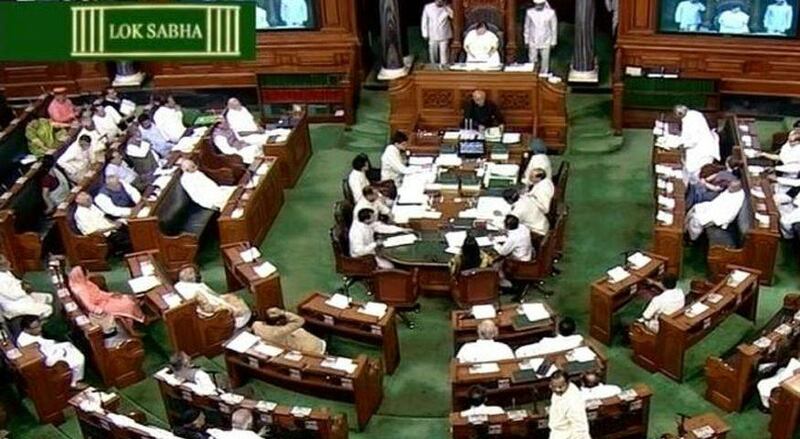 NEW DELHI: The Lok Sabha today passed two bills extending Central GST and Integrated GST to Jammu and Kashmir, with Finance Minister Arun Jaitley saying the step will ensure greater economic integration of the state with rest of the country. The Central Goods and Services Tax (Extension to Jammu and Kashmir) Bill and the Integrated Goods and Services Tax (Extension to Jammu and Kashmir) Bill passed by the House by a voice vote are aimed at giving effect to the formal amendments required in Central GST (CGST) and Integrated GST (IGST) Acts by removing the exemption that was carved out for J&K. Replying to a debate on the bills, Jaitley said it was a positive step that Jammu and Kashmir has been integrated with GST and the dream of one tax regime is now met. He hit out at the Congress for its reported claim that GST would infringe upon the special status of J&K. The finance minister said a national party such as the Congress should not have got itself entangled by taking such a stand which is the “argument of the separatists”. He asserted that the “special status (was) never meant to create economic impediment” for the state whose government, asssembly and people he “complimented” for the roll out of the new tax regime. “If they (J&K) didn’t integrate, then the traders would not have got input credit and the tax on final products would have been higher… That would have made products costlier and consumers would have to pay more,” the minister said. “J&K is a consumer state and GST being a destination- based tax, the revenues of the state would increase,” he said. He said if GST was not put in place in J&K, then customers would prefer to buy products like cars and refrigerators from outside the state, thus causing economic loss to traders and customers of the state. The CGST (Extension to Jammu and Kashmir) Bill, 2017 provides for levy of the GST on goods sold and services rendered in the state while the IGST (Extension to Jammu and Kashmir) Bill, 2017 seeks to levy the tax on inter-state movement of goods. The GST, which replaced more than a dozen central and state levies, came into effect from July 1 all over the country except J&K where the assembly passed a resolution adopting the constitutional amendment only on July 5. Thereafter, the President issued an ordinance extending the provisions to the state. This was necessary because of the special status that J&K enjoys in the Constitution. The J&K assembly then passed the Jammu and Kashmir Goods and Services Tax Act, 2017 which came into force on July 8, 2017. As Parliament was not in session and an urgent legislation was required to be made, the President had promulgated the Central Goods and Services Tax (Extension to Jammu and Kashmir) Ordinance, 2017 and the Integrated Goods and Services Tax (Extension to Jammu and Kashmir) Ordinance, 2017 on July 8, said the statement of Objects and reasons of the two bills. Participating in the discussion on the bills, Adhir Ranjan Chowdhury (Cong) asked the government to ponder over why it is taking recourse to Ordinance for every legislation. He said while the UPA government was accused of policy paralysis, the present government is undergoing “policy dialysis” and hence there was “economic stasis”. “When we have access to Parliament, we should not frequently resort to Ordinance,” he said, adding the government had failed to impress upon the J&K government to implement GST from July 1. Chowdhury said GST, as implemented, cannot be called ‘one nation, one tax’ as nearly 50 per cent of the GDP remains out of its ambit. “Given the sensitivity of the J&K region, you should have been better prepared before introducing the tax regime,” he said, adding the apprehension of people of the state should be allayed by assuring that Article 370 giving them special status as well as fiscal autonomy would not be tampered with. Shashi Tharoor (Cong) said that extending GST to J&K has “serious impact” as it alters the taxation power of the state and by “impinging” on the state’s right the Centre is violating the Constitution. “J&K must be approached with sensitivity, but no sensitivity was shown as the bill was passed in assembly when Opposition was not present… It could signal future problems,” Tharoor said. He said the state has been dealing with conflict and the government should not do anything which impacts its stability. “GST was implemented in extreme haste… GST Network is in shambles,” he said, adding Malaysia was given one-year time before GST was implemented there. While the Centre had promised a simple tax, in reality GST has become ‘one nation, three slabs and six taxes’ (0, 5, 12, 18, 28 and 40 per cent), Tharoor said, adding the structure is “irresponsibly complicated”. The Congress leader from Kerala said that J&K is facing increased terrorism and “we need to do everything to protect the interest” of the state and see that it is not undermined by “finance ministry’s terrorism”. Anandrao Adsul of NDA ally Shiv Sena said that Article 370, which grants special status to J&K, should be removed. Thupstan Chhewang, BJP member from Ladakh in J&K, also wanted abrogation of Article 370 for peace and tranquility in the state. He also urged the finance minister to exempt Ladakh from GST for five years. Anurag Thakur (BJP) described GST as the biggest achievement after Independence and said Jammu and Kashmir would be benefited a lot from it. “For economic integration, it (GST) is a big step,” Thakur stressed. Kalyan Banerjee (TMC) said the cost of most of the goods and services have increased post the GST and the GST Council has “arbitrary” powers to fix rates even without consulting Parliament. During Banerjee’s speech, Congress leader Mallikarjun Kharge pointed out that the finance minister was not present in the House, while the treasury benches contested that Minister of State (MoS) for Finance Santosh Gangwar was present.